Navigating the Apple Watch can be a little confusing at first, and it definitely takes a while to get your notifications dialed in so it’s not bugging you too often, but you’re still finding out what you need to know. These tips can help you adjust what the watch shows you and how, so you’ll spend less time fiddling with settings and more time enjoying your new arm candy. If you’re one of those people who allows push notifications for every app on your iPhone, the Apple Watch will drive you insane. This is a gadget that requires very specific tailoring to ensure you’re only getting the most important alerts. Otherwise your wrist will be barraged with taps. Get to know the Apple Watch app on your iPhone: It will make your watch the personalized device you want. Every app on your iPhone can send notifications to your watch. Trust us, you don't want that. In My Watch > Notifications, you can pick and choose which apps you want to receive notifications from. Even non-watch apps that just live on your iPhone will send you watch notifications if you let them, and you shouldn’t. Pick which apps make sense to see on the watch and mirror those—turn the rest off. The watch’s native apps like Messages and Weather let you further customize the alerts you receive, so they don’t have to exactly mirror your iPhone notification settings. Something to note: If you want to make sure you receive notifications on the watch from specific apps, you need to change all of those apps’ notification settings on your iPhone. This can be insanely time-consuming, but worth it. Otherwise, the watch will drive you nuts. You get to your notifications screen by swiping down from the watch face. 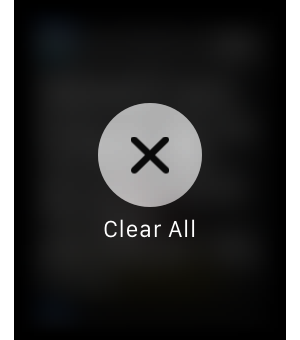 Once there, you can clear notifications one at a time by swiping it to the left and tapping the X, or just force-touch the screen for a larger X button that can clear all the notifications in one tap. You’ll be demonstrating your new Apple Watch to friends and family and random passersby—trust us, a lot of people are going to be interested in how it works. If you’re worried about them inadvertently seeing previews of your email messages in the notifications list, just go to the Apple Watch app for iPhone, and turn on Notifications Privacy, in the Notifications menu. You’ll still see notifications for email and messages, but you need to tap one to see what it actually says. Your Apple Watch battery will last all day with regular use, but if you’ve drained it before the day is done, don’t worry: You can still salvage the situation. Just swipe up from the watch face to see the battery percentage in glances, then tap Power Reserve to put your watch in conservation mode. This lets you use the watch as, well, a watch, but you won’t be able to access any apps or do anything else with it. One of the biggest battery drains is the Workout app, which uses the watch’s heart rate sensor to accurately measure your workout intensity. 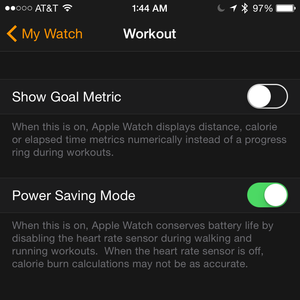 A half-hour workout can easily eat about 15 percent of your battery life, in my experience, so to prevent that happening, turn off the heart rate sensor in your iPhone Apple Watch app under My Watch > Workout > Power Saving Mode. Your calorie count probably won’t be as accurate, but at least your watch will live to die another day. The watch is great for notifications, but if you need to dive deep into a task, the iPhone’s larger screen real estate is more ideal. That’s where Handoff comes in: You can easily transfer from the watch to the iPhone in Mail, Maps, Messages, Phone, Reminders, Calendar, and Siri. Wake your phone when you’re ready to open the app and look for its icon in the left corner of your lock screen. Swipe up on the icon to open the app where you left off in the watch. (This won’t work if your watch and phone aren’t in Bluetooth range.) 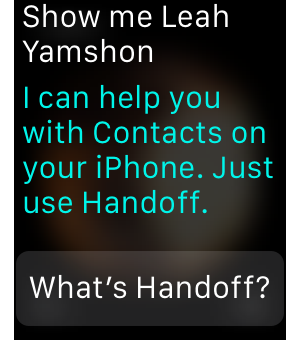 You can toggle Handoff on and off in your iPhone’s Apple Watch app under My Watch > General > Enable Handoff. Swipe up on the watch face to view glances, which are quick nuggets of information, either the latest or the most important, from both native apps like Weather and Activity and third-party ones like the New York Times and Twitter. While plenty of apps have glance views, you quickly realize that you don’t need immediate access to summaries from every single app on your watch. 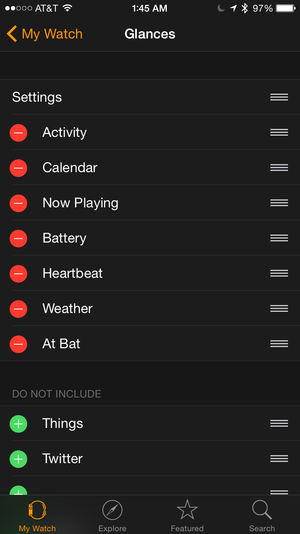 Remove apps you don’t want to see in Glances from the Apple Watch app on your iPhone. Go to My Watch > Glances, then tap the red minus sign by the ones you don’t want to see. See ya, Stocks! Then drag and drop apps in the order you want to see their glances on your wrist. I moved Weather and the Times app to the top of the list, because I typically look at glances in the morning when I’m getting ready for the day, but your mileage may vary. One of Apple Watch’s coolest features is the Taptic Engine, which sends you haptic feedback, or a light tap on the top of your wrist, when you receive a notification. It’s so much less annoying than a chime or a vibration. 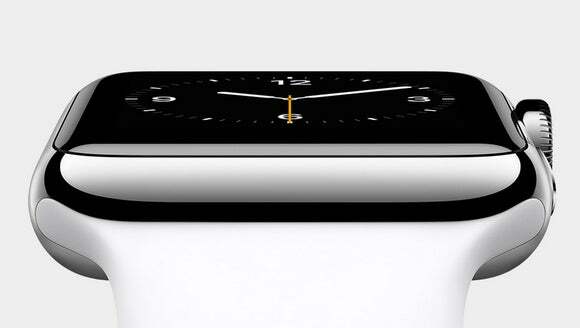 In fact, you can even turn off the watch’s alert volume in the Apple Watch app’s under My Watch > Sounds & Haptics. 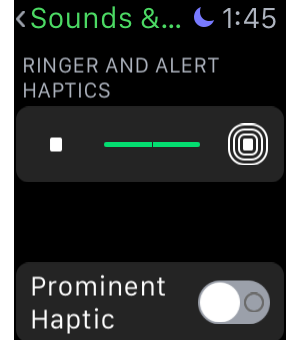 You can change the intensity of the haptics in the watch’s Settings app (which is one of the few things not buried in the Apple Watch app on your phone). Within Settings, use the Digital Crown to scroll down to Sounds & Haptics and use the sliders to adjust the their strength. 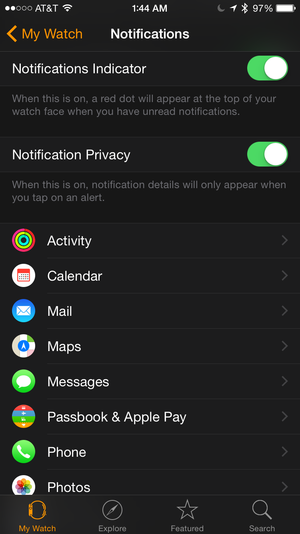 You can also toggle on the Prominent Haptic setting to ramp up the intensity of alerts. If you’re left handed, your watch can be too. 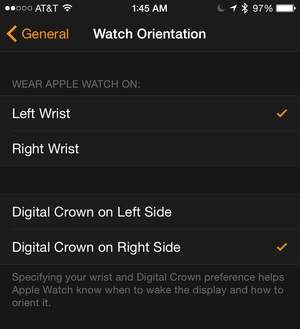 Open the Apple Watch app on your iPhone, go to My Watch > General, and look for the Watch Orientation setting. You can specify if you’re wearing the Apple Watch on your left wrist or your right wrist, and on which side you like the Digital Crown. That way the watch’s display will be right-side up, and all you have to do is reverse the watch band. To remove your watch band, press the small button on the back of the watch near the top, next to where the band connects. With that button down, slide the band out of its slot on the watch. Then repeat for the other side of the band. Reverse its orientation and slide each end back into the slots until they click. Open the Settings app on the watch itself, and choose Brightness & Text Size. Here you’ll be able to pump up the size of text on the watch’s screen by a couple of notches, as well as make it bolder. (Selecting bold text will restart your watch.) If you find yourself squinting at text on the Apple Watch’s screen, this is exactly what you’re looking for. You can whip through lists of songs in the Music app, or contacts in the Phone app, by giving the Digital Crown a quick twist. When you turn the crown fast enough, you’ll start scrolling by letters instead of by individual items. If you’re looking for Taking Heads music, just quick-scroll to the T section of your Music app, pause, and then just tap Talking Heads in the list. Scrolling with the Digital Crown is a great tactile feeling that just might make you miss the clickwheel on your old iPod. What tips have you discovered for your Apple Watch? What are you having trouble with? Let us know in the comments!